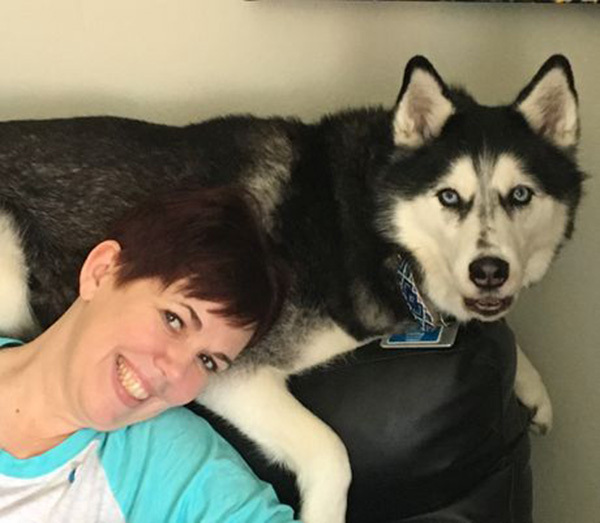 A Siberian husky has sniffed out her owner’s cancer, not once, but three times! The first time was in 2013. Sierra was only 9 months old when Stephanie Herfel received her from her son who was leaving for overseas duty. “She put her nose on my lower belly and sniffed so intently that I thought I spilled something on my clothes. She did it a second time and then a third time. After the third time, Sierra went and hid. I mean hid!” Herfel told the Journal Sentinel. Herfel had been feeling pain in the area, but an emergency room doctor said it was an ovarian cyst and gave her pain medication. But the dog knew better than the ER doctor. The dog acted oddly, got herself in a tight ball and hid deep in a closet. A few weeks later, after taking the signals from Sierra, Herfel saw her doctor and got the diagnosis of stage 3C ovarian cancer. Herfel underwent chemotherapy, a full hysterectomy and spleen removal to beat the cancer. In 2015 and then in 2016, Sierra hid again, and Herfel feared the worst. She was right. Cancer had returned both times, first in her liver and then in her pelvic area. Herfel, now 52, continues to remain optimistic.